Add a new golfer to your membership roster. Create a small 20-man tournament, and sign up the golfers to play in a tournament. Add a guest to the tournament. Build flights, build teams, and assign tee times. 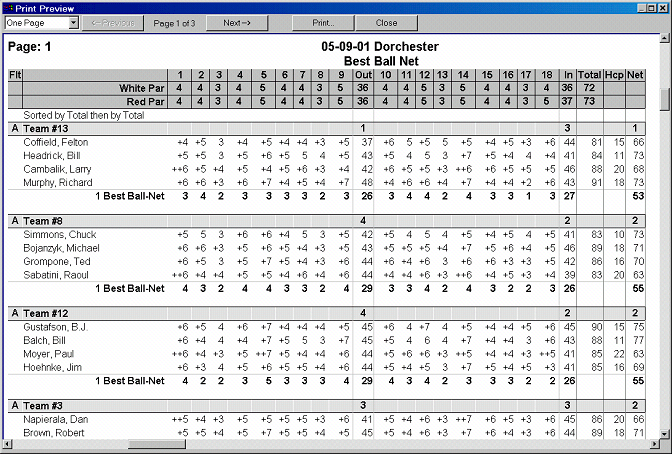 Print a pairing sheet, scorecards, and other reports. Post score cards and print results. You should be able to complete all this in about 20 minutes. By the end of this tutorial you will have a basic understanding of how to run a tournament. Click the tab (top left corner of the screen). Select Roster menu, click Open Existing Roster. The Load Roster form appears. 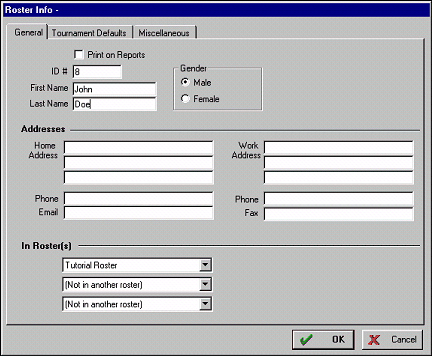 This form lets you select the roster you want to view. Double-click on the line that says Tutorial Roster. This will select to display the tutorial roster. Note: You can have any number of rosters in TM. Most organizations have only one roster, but you can break your membership into multiple rosters if needed. Click the New button, or press the INSERT key. The golfer’s ROSTER’S INFO form will appear. Type the first name of the golfer...John...and press the TAB key to move to the next field. Type the golfer's last name...Doe. Click on the Tournament Defaults tab to see John’s tournament defaults. Click in the Index box and type an index of ... 10.6. You could continue to add other information, however you already have the minimal information needed. Click OK button, or press ENTER to close the form. Click your mouse on the (sort icon) or pull down the View menu and select Sort Membership Roster. The Sort by form appears. In the First Sort by list, click on the item Golfer to highlight it. Click on OK to sort the list. Click the tab. The Tournaments form appears. This is where you create new tournaments, load existing tournaments, or delete old tournaments. TM lets you run any number of tournaments. Click the New Tournament button. Click Yes to start the new tournament. The Start a New Tournament form appears. Type Tutorial for the tournament name and click OK. The Tutorial tournament now appears in the Tournaments list, ready to load. Double-click on Tutorial to load the tournament. Click the tab to see the Tournament Parameters form. You are running a small tournament with 20 golfers, five teams with four golfers per team. The tournament also has four flights. Set the Number of Rounds to…1… and press the TAB key. Set the Number of Teams to ...5 ... and press the TAB key. Set Players per team to ... 4. Set Number of Flights to ... 4. Set Number of tees for men and ladies to… 1. 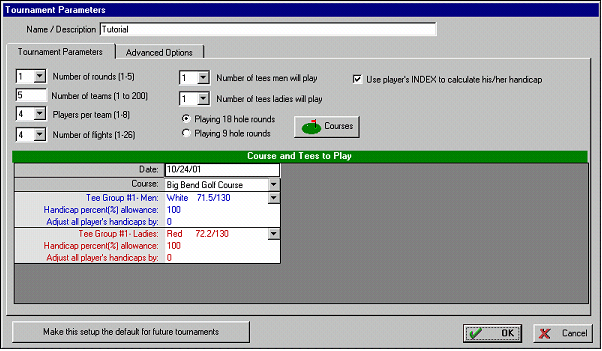 The option Use player’s INDEX to calculate his/her handicap should be CHECKED. This will be an 18-hole round tournament so make sure Playing 18 hole rounds is marked. The course to play can be any course in your course library. If you wish to enter a new golf course, click on the Courses button and add the course. Set men to play the White tees and ladies to play the Red. The default handicap allowances (100%) are okay. This form also gives you some other options but they do not apply to this tournament. All the rest of the defaults are OK.
Click OK to save the Tournament Parameters. Note: Tournament parameters can be changed at any time. Click your mouse on the tab. The Signup Sheet for the Tutorial Tournament appears. Click your mouse on the New button. The golfer’s Roster info form appears. Type the first name of the golfer...Ted...and press the Tab key to move to the next field. Type the golfer's last name...Smith. Click the Tournament Defaults tab and type in an index of ... 16.3. Press Enter to close the form. John Doe's handicap is not current, you need to edit his handicap. To move quickly to John Doe type ...Doe...and press ENTER. Or double click on his name to view his information. 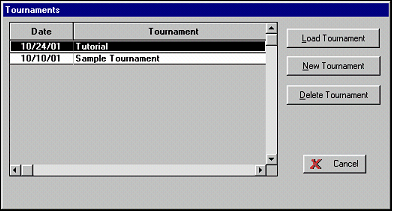 Click the Tournament Default tab and type in a new index of 11.1. Click on the first player on the list (under *Blind Draw*). He/she will be highlighted. Hold down your SHIFT key and click on the last player at the bottom of the list. Notice how all the golfers are highlighted. Click the (Sign up) button. All players move (sign up) into the tournament. Note: For this tournament, it does not matter which team a golfer is initially placed on. In a couple minutes you are going to let TM build teams automatically for you. Tip #1: There are four ways to signup an individual golfer to play. Drag the icon to the left of each player’s name and drop it on whichever team you wish him/her to be on. Highlight the player on the left side of the screen, right-click the mouse and select Sign up on the menu. The player will move onto whatever team is highlighted on the right. Highlight the player on the left side of the screen and click the button. The player will move onto whatever team is highlighted on the right. Press the Spacebar to signup a player. Tip #2: TM uses the standard Windows keys to select multiple items from a list. Hold down Shift key while clicking to select a range of items from a list. 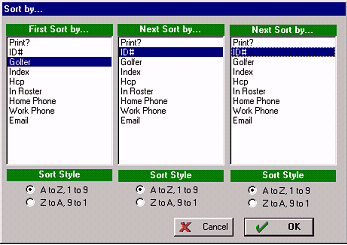 Hold down the Ctrl key while clicking to select multiple individual items. Click your mouse on the tab. The Tournament Sheet appears. 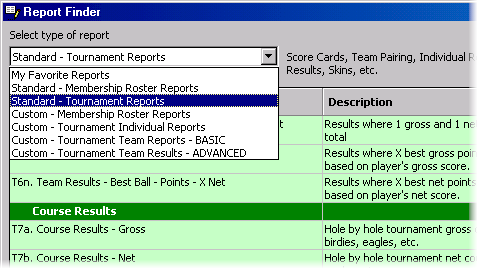 The tournament sheet is the heart of TM and allows you to build flights, build teams, set tee times, view your pairings, post results, print reports, etc. The list of participating golfers is displayed in the list box. 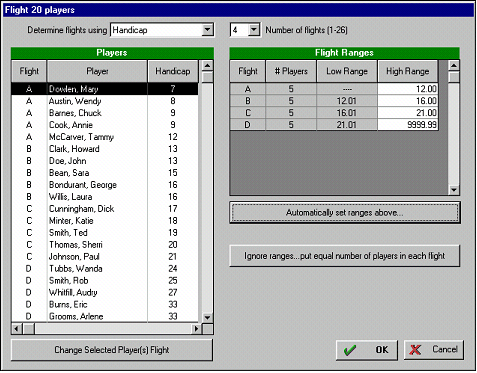 Click your mouse on the Tools menu and select Automatically Flight…Players. The speed key is Ctrl F.
Click your mouse on the Automatically set ranges above button to automatically calculate flight ranges. Notice that TM places five golfers in each flight. Note: You can also manually set your flight ranges. Click the OK button to use these flights. Now you want to create teams. For this tournament you want each team to have an A, B, C, and D player with total team handicaps as close as possible for each team. Ted Smith is John Doe's guest so you want to make sure they appear on the same team. To do this you will lock both on the same team. Select John Doe. Double-click on his name to show his information form. Check the option Lock on Current Team. If you look closely you will see that John is now on team 1, and the second column (Lock) has a check. This means that John is locked on team 1. Since you want Ted to play with John, you need to lock Ted on team 1 too. Double-click on Ted Smith to show his information form. Now both John and Ted are locked on the same team. In other words, they will play together no matter how you calculate teams. No one else is required to play together so you want the computer to build the remaining teams. Tip: You can do the above much faster by simply dragging the icon to the left of each player’s name and dropping it onto team #1. Click your mouse on the Tools menu and select Automatically build teams…Balanced. The Calculate Balanced form appears. Notice all the options you can set. TM can consider many criteria when building teams, such as: groups, gender, cart\walk, preferred tee times, and handicap. However, these options are beyond the scope of this tutorial. The default options are good, click OK to calculate teams. The computer will crunch some numbers and display the calculated teams on the screen. To “sub-sort” teams by flight, so that the A player is at the top of each team…click the sort icon. The Sort What form will appear. Make sure PLAYERS ON TEAMS is checked, and click OK. The Sort by form will appear. In the First sort by list select Flt (flight) and click OK. Team are now sub-sorted by flight. Assure that John Doe and Ted Smith play together. Notice that John and Ted both appear on team 1. Assure each team has an A,B,C,D player. TM also tried to make each team handicap as close as possible to each other team. 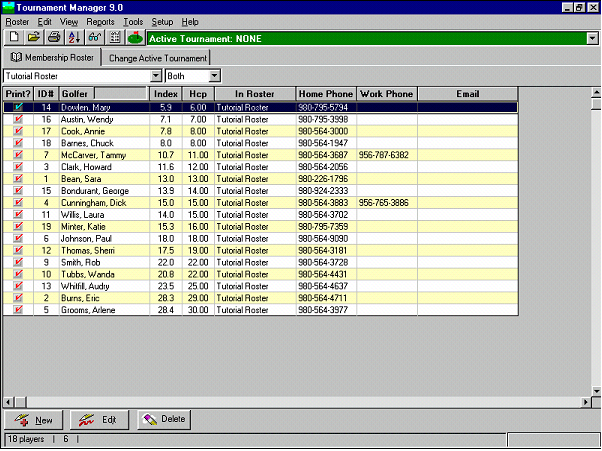 Now you need to set tee times for each team. You want to set up a regular tee off with 7.5 minutes between each tee time. The first tee time is at 9:00AM with each team starting on hole 1. Select the Tools menu and click Set teetimes. The Tee Times form appears. Make sure Regular Start is checked. Make sure the Increment time every x team(s) is set to 1. The Time increment between teeoffs should also be 07:30 minutes. You need to set the start time for the first team to 9:00AM. Click the button Automatically fill in times for teams below the highlighted one to automatically fill in for the remaining teams. Click OK to close the Tee Time form. You will be back at the Tournament Sheet. Notice all the tee times are displayed for each team. Select the Reports menu. The Reports Finder form appears. TM provides many different predefined reports, plus you can even create your own custom report layouts. Select Standard - Tournament Reports. Double-click T3a. Team Pairing Sheet. The Team Pairing Sheet form will appear. This form allows you to customize what items appear on the report and how it is sorted. After you've set all options click OK to view the report. The report will appear on the screen. If you want to print this report to your printer click on the Print button. After you have viewed this report, pull down the Reports menu and view/print some other reports. Feel free to experiment. Click on Close button to exit the reports form. You will be back to the main Tournament Sheet screen. This marks the end of the tutorial. While this is just a small basic tournament, we tried to provide a sample of the "process" involved to pair golfers for a tournament. The best "place to go next", besides trying to create a tournament of your own, is to read the remainder of this documentation. Feel free to experiment with the software. There is nothing you can do that can't be undone.